Probably the first sleeping bag Three Points of the Compass ever slept in was that used on family camping trips. This was one of three bags, already old when used by myself, of indeterminate origin, that actually held up pretty well. It was a pale cream, yellowed and stained, cotton bag with a down and feather stuffing. If nothing else, these bags showed how long a serviceable life a down fill could provide. They were used quite a lot too; long family camping trips every year as my siblings and I grew up, also long summer weeks in the garden ‘pup tent’ during school holidays, and eventually borrowed by myself when I began my own exploring in my teens. In the late 1970s, by dint of saving hard and pressing for cash presents for a birthday or two I bought what was the most expensive item I had ever purchased. Costing £126, I recall my parents questioning my sanity and extravagance. The sleeping bag I bought myself was the one being raved about in the magazines at the time and I was very excited. The sleeping bag was made by Sheffield manufacturer Buffalo. Instead of a down fill it had a synthetic fibre pile inner and bright orange Pertex outer. All pretty radical stuff at the time. The brown fur faced inwards and the bag was incredibly warm. So warm in fact that I don’t ever recall being cold in the bag. Instead, I do recall the many nights when I was simply sweltering. It had a tight mummy fit with shaped foot box. There was no other way to lie in the bag other than ‘Egyptian PT’- out straight, legs close together with arms folded across the chest. The central zip extended to the belly and I usually had this open in an attempt to cool slightly. The result was that my chest was often freezing while the rest of my body sweated. I understand the bags made today have a zip that extends further. If I learnt anything from this purchase it was that I did not like to be restricted in movement in my bag. Typically for a synthetic bag it was both weighty and pretty bulky. Nonetheless I used the bag for every trip I made, including when I planned on stealth camping following the annual Great British Beer Festival in 1980 (the year it was held in large marquees in the grounds due to a fire at Alexandra Palace, North London). Going to get my final beer of the night, my pack was stolen, together with my sleeping bag. Instead, I spent the night, shivering, wrapped in two bin liners in a bed of nettles. By now, I was in the Army, so I simply used an army issue sleeping bag most trips I made. 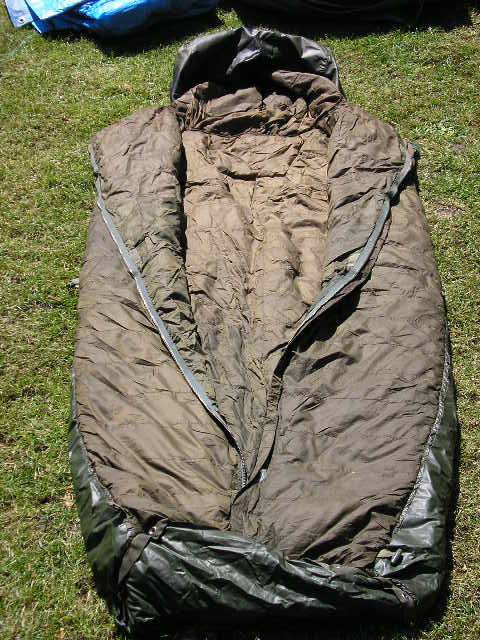 I did use a synthetic Snugpak Softie sleeping bag for a while, their bags were very popular amongst the military, but it was ‘borrowed’ while I was away on exercise for a few weeks. The bulky 1958 pattern bag was a ‘squaddie proof’ sleeping bag churned out in probably hundreds of thousands for the army over the decades. They varied in length- small, medium and large, but everyone sought the, almost impossible to obtain, extra large. This was because there was frequently the need to sleep fully clothed, boots and all, in case there was a need to ‘stand to’ during the night. While supposedly a down filled bag, there was a good quantity of feather inside the nylon bag. The ‘green maggots’ came with a sewn in waterproof groundsheet and took a beating. I have spent more nights in one of these bags than any other I have owned. A liner was occasionally issued, but usually only to increase insulation in colder climes. I recall cowboy camping in one of these with an urgently issued liner when temperatures suddenly plummeted in October 1981 on the frozen plains of Suffield, Alberta, Canada. I was unable to sleep, not because of the sub-zero temperature, but due to the sheer beauty of the night sky in an area unpolluted by light. It was some years before I purchased another ‘serious’ bag for camping. When I did, my choice reflected a few lessons learnt. Purchased in 2007, the Mountain Equipment Dreamcatcher 750 was a down bag. The 750 indicates there is 750g of Down in the bag, or was, because despite the diamond rip stop shell material, the down does quite often poke through. A bargain for what you get (£180, reduced from £200), it is a 90/10 down with a fill power of 600. That last bit probably means little to anyone! The ratio 90/10 simply means that it is a mix of 90% (expensive) down with 10% (cheap) feathers. Fill power is a measure of loft. The higher the fill power the more air an ounce of the down in question can trap. The more air trapped, the greater the insulating ability. High quality down will have a high fill power, low quality down, or a higher percentage of feather, the lower the fill power. Fill power ranges from about 300 to around 900. Some manufacturers now use hydrophobic down, this is down that has been treated with a water repellent to enable it to repel water (though not indefinitely), dry faster and loft better when wet. This treatment process does adversely affect the fill power of down to a small extent. Such a process was not available when I purchased my Dreamcatcher bag, but, with great care, I have never suffered from it wetting out, thankfully. The rip stop shell is bright blue but the inner is a dark navy. A dark interior to a bag is a welcome facet as it aids drying out or airing in the morning sun. Body length and shoulder are 219cm x 82cm (Reg). Packed size 31cm x 20cm. Weight 1660g, so not a particularly light bag to carry. But this does include a reversible stuff sack with micro fleece lining that can be stuffed with clothes and used as a pillow. I usually stuff a sleeping bag into a waterproof stuff sack. 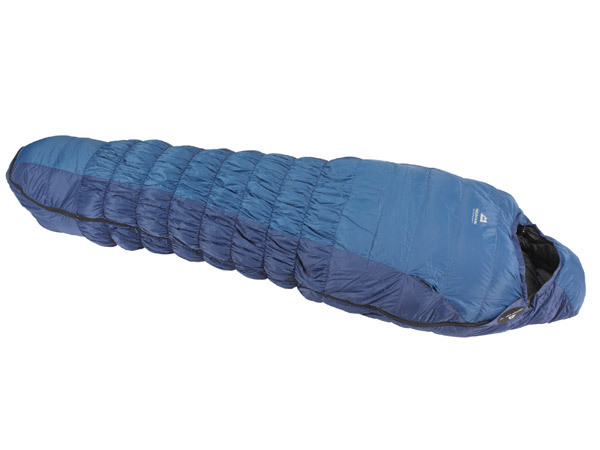 This is especially needed as, due to low(ish) weight combined with high volume, a sleeping bag is best kept in the bottom of a pack where there is also a greater risk of water pooling or soaking through the base of the pack. My bag supposedly has a comfort temperature of down to -3°C. The Mountain Equipment recommended temperature sleepzone is +10°C to -12°C. I don’t think I would like to push those limits though. The bag also has a number of features that I like- Box wall baffles, Shark Toe design, neck and zip baffles. Even though the bag has a hood, I am not too keen on this as I turn around so much in a bag at night that I invariably end up facing in to the hood. I chose a left hand zip, my wife had a right hand zip, this permits the bags to be zipped together if we wish however we sleep at completely different temperatures. She purchased the Dreamcatcher 1000 but still finds this occasionally cold at night in quite mild conditions. 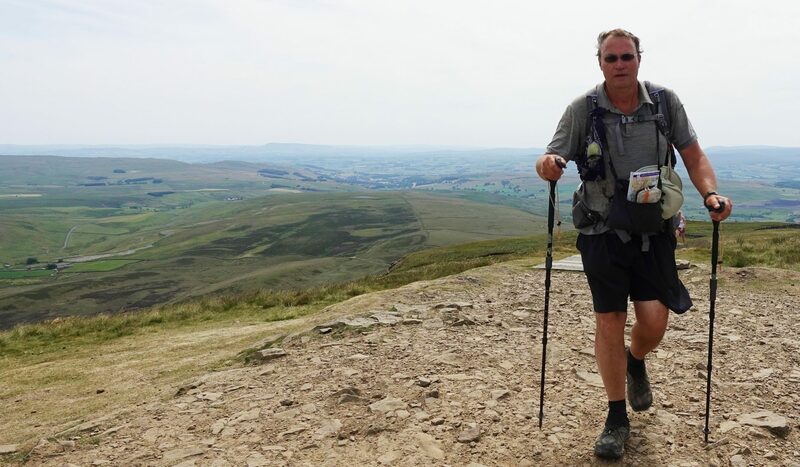 The Dreamcatcher also came with what Mountain Equipment termed a Thermo Dynamic System (TDS) which “improves comfort, loft and thermal efficiency”. I quite like this feature as it combats, to a degree, that restricted feeling that I am not too keen on. There is stretchiness to the body baffles that expands as you move within the bag and then gently contracts around the body as you settle, nice. The full length zip also allows it to be opened up fully to air or be used as a quilt. It was this occasional use as a quilt, simply draped over me, that helped convince me I could regulate body temperature far more efficiently via such a method. I bought all of my preference together when I made my next purchase. I wanted to stay with a down bag because of that materials lightness and lack of bulk. However I do respect that I live in a frequently damp country so wanted a hydrophobic down of good quality. I’m a big lad who sleeps on his side so needed to consider a larger option if there was one. Finally, I was now decided on going the quilt route as this seems to work for me so well, all I needed was an effective method of sealing in the draughts. Because the quilt is only rated by the manufacturer down to -1°C (30°F) I had it over stuffed with an extra three ounces of down to push its limit a little further. The quilt is stuffed with 850 fill power hydrophobic goose down. Even though I ordered the 6′ 6” long and wide version, it still only weighs 753g including the stuff sack that I will probably swap out for something else at some point. The extra width permits me to sleep on my side yet still have the quilt tucked in nicely around the body, most importantly, the small of the back. The outer shell fabric is down proof Pertex Quantum ripstop (0.85oz/yd) and has a durable water repellant (DWP) coating. The inner is made from downproof Pertex Quantum Taffeta (1.0oz/yd) which is lovely and soft and again has a DWP treatment. There are a number of other features that make the quilt work well. Differential cut allows the bag to loft well, the continuous baffles mean that down can be moved around if necessary to suit the prevailing temperature. The down collar fastens nicely if required. I do need to consider head wear if the temperature is going to drop substantially. The foot box is well shaped and has overstuffed baffles. It really is a beautifully made piece of gear with a lot of careful thought. The system that Katabatic Gear use to keep the bag tight around the body is ingenious. There are a number of videos that show the method far better than I can explain. Quite simply, though this was an expensive purchase from a cottage manufacturer in the USA, this is easily my favourite piece of kit at present. Do you have any advice for refilling the 58 pattern bag with new down? My bag is empty of down in some sections. How can I go about refilling it? I cant find any information about that online. Thanks. Hi Luke, I understand how attached you can get to an old sleeping bag. Are you really sure it isn’t time to let this one go? I have zero experience of refilling a down product. However if you fancy having a go yourself, tracking down a supplier of down (or feather/down mix as in the 58 pattern bag) who will supply to the public rather than the trade, can be a little difficult. I have no personal experience of any of those mentioned next but I see extremtextil advertise down for sale. Over the years I have also heard good things of a company that repairs equipment, these are Scottish Mountain Gear. There will be other companies that do similar, such as Mountaineering Designs. I would guess this could turn out an expensive option for you though. Your call… best of luck!